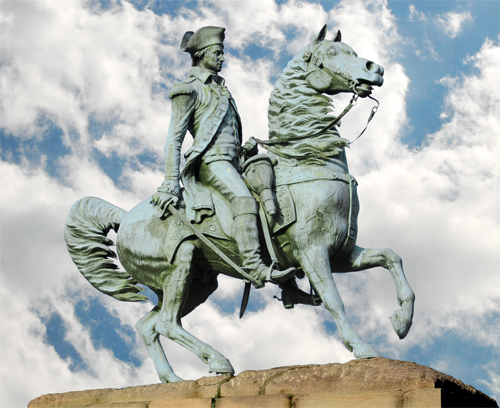 Clark Mills was the sculptor for this equestrian statute of George Washington located in Washington Circle in Washington DC. The striking pose shows Washington riding the horse with sword drawn but held pointing downward. The Clark Mills Sculpture of George Washington is located on Washington Circle in Washington DC where K Street NW, 23rd Street NW, Pennsylvania Avenue NW and New Hampshire Avenue NW intersect. 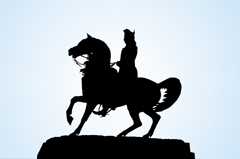 Click Here for Google Map showing the location of the George Washington Equestrian Sculpture at Washington Circle. Closest Metro Station: The Foggy Bottom-GWU Metro Station on the Blue and Orange Lines is nearest to this sculpture of George Washington.